There are certain benefits to having a sick child. For example, I have a handicap sticker and a fabulous parking spot at any Wal-mart on the planet. For two and half years I’ve had a built-in excuse to avoid anything I didn’t want to attend…ok, maybe she didn’t have pre-bubonic plague…five times. And hospital swag. Oh yeah! If you’re going to be stuck in the hospital for a week, you should at least get to score some freebies (which are never really freebies because GOD KNOWS we’re paying for it!) and take home some supplies. Latex gloves – which came in extremely helpful when Peyton went through that patch of constipation and required suppositories. Tape – well, cause you can never have enough tape (I may or many not have ran out of scotch tape one time and wrapped up a present in Hypo-fix). 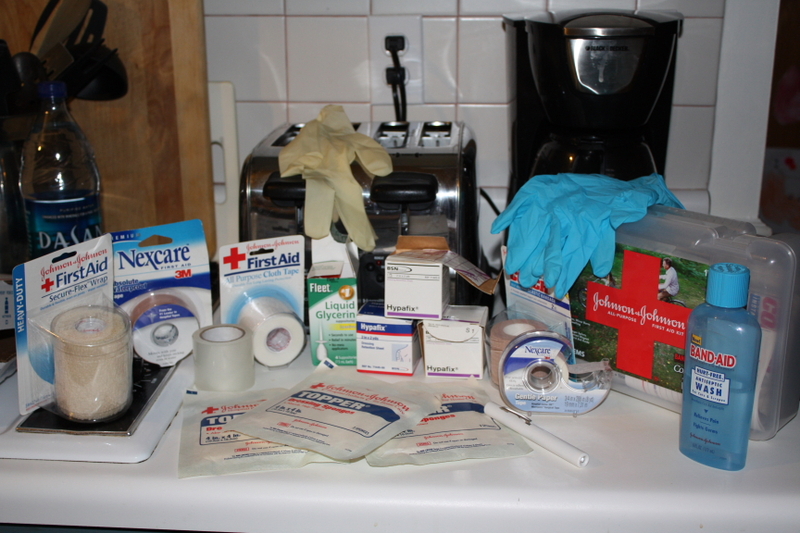 Bandages, gauze, socks, pull-ups, flashlights, Bacitracin, alcohol swabs…and band-aids. LOTS and LOTS of band-aids. I cut the bottom of my foot while I was up at Pete’s last weekend and the crappy thing about a cut in that place is that no matter what, you can’t STOP irritating it! So it kept popping open and bleeding and getting all funky. That’s how many empty band-aid boxes I found in all the band-aid-y places in my house. I couldn’t even find one of those retarded little round ones that has a peice of guaze the size of a chicklet. My kingdom for a band-aid! I have hoarked enough medical supplies to host my own episode of Grey’s Anatomy and I can’t find a band-aid. Thank you, children! When my cut gets infected, I develop gangrene, find out that amputation is my only option, and have to have one of those special made springy prosthetic feet, I’ll know that it was because you can’t stop putting band-aids on your windows as room decor! Posted in: Mayhew niblets, Mom memoirs, parenting is harder than it looks, side effects, things our kids do, we are a little crazy, welcome to my crazy. Ha-ha! I still get teased about this but when I was younger I used to put band-aids on my legs. For no reason. I mean, one of the band-aids was for a reason (like I scratched a mosquito bite to the point where it bled or something like that) but the rest of the 20+ band-aids on BOTH legs…yeah, those were there for the hell of it. Don’t know why I did it but I did. And last night I made the bottom of my foot bleed a little, I’m SOOOOO not telling that story, and instead of putting a small band-aid on it I got the jumbo one b/c my reasoning was that it would stay on better while I slept versus the small one that would fall off:) So, if in the future anyone in this house needs a big band-aid they’re just going to have to suffer w/a bunch of small ones…..if they’re even available then! Ha-ha! I am glad to learn I am no the only on pilfering medical supplies from the doctor’s office. Where do the bandaids go? We always have empty boxes here, too. I hear you. BUT, if you were at my house and needed a bandaid, I might have one for you. It would have Little Einsteins on it, though. Because everyone here has outgrown Little Einsteins and therefore REFUSES to use the bandaids. Even when you can’t see them. So, I am the one forced to go out with the little brats on my nose where the dermatologist froze off a place. Wow, I didn’t realize how emotional I was over this. I’m feeling much better now…. Yes! So true! Or the character bandaids. Gotta walk around with Diego or Cars since that’s all you have, and that’s if you have any at all! I love it. After all, necessity is the mother of all inventions. You’re kinda like survivor man! I have a 3 year old cutter. I think I really need to see a photo of the unrolled tampon on your foot. Cause that? Is the best part of all. Nice improvisation. Much better than when I used a tissue and scotch tape. I have Scooby Doo bandaids! You should have seen my 77 year old mother walking around with that one on. That was of course after we slowed the gush of blood (due to blood thinners!). And we prayed she wouldn’t sping a leak! OMG, you crack me up. I have a similar in need of band-aid story. I cut my finger on a razor while digging in a suitcase bag……while on vacation obviously. We had no bandaids. I finished drying my hair with tissue on my finger which would not quit bleeding. Later the next day, after proper bandaids had been purchased, for probably $18 dollars a box in that tourist town, my husband demands that I “change the bandage”. Well, he went to retrieve new bandaid and I took the old one off. When he returned, I showed him my finger and he went nuts. He was gagging and heaving and acting crazy. So, I had to tell the whole internet and make fun of him. I thought this phenomenon only occurred at my house! How awesome to know there are others out there like me…..who can’t find a flipping band-aid, EVER! And, no matter how much I piss and moan about finding empty boxes throughout the house (pantry, bathroom, fridge, etc.) there are ALWAYS still empty boxes…never put in the trash!!!!!! And I thought they were only good for bloody noses. We have boxes of med supplies all over the place. More latex gloves than a-holes in the world, I think. Also a kangaroo pump for G-tube feeding (works get with beer for an all-day buzz), a suction pump to get those hard to reach boogers … AND THERE’S MORE! Dude. WHY didn’t you put hypafix on your foot? There is NOTHING that stuff can’t do. I steal it from hospitals every chance I get! Hospital swag. LOL! It might not be free, but it sure feels that way! When KayTar had surgery a couple of months ago, they gave her some socks with rubber soles on the bottom, they are WAY better than regular slipper socks. I can’t find them anywhere, but we’ve sure used our freebies. I can’t wait till one of my kids gets a cut so I can tape a tampon to it. Absorption AND entertainment!